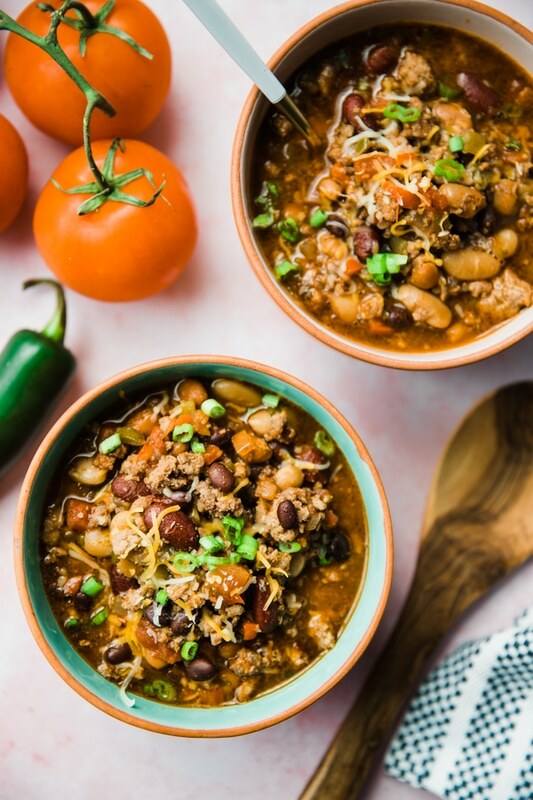 Four Bean SPICY Crockpot Chili is a go to recipe for Super Bowl, BBQs, Memorial Day, 4th of July…really any holiday or gathering with friends & family! Typically every year my mom makes chili so I had to share it her recipe. WARNING: It is a lot different from a traditional chili but it is SO yummy. It also contains quite a few ingredients and spices, so don’t let that scare you away. The combination of ingredients creates something magical! It is a lot different from a traditional chili but it is SO yummy. It also contains quite a few ingredients and spices, so don’t let that scare you away. The combination of ingredients creates something magical! Allowing the flavors to mix together over a 4-6 hour time period in the crock pot is essential to the bursting flavor. You won’t want to miss this recipe at your parties this year! I hope you enjoy as much as my family does! 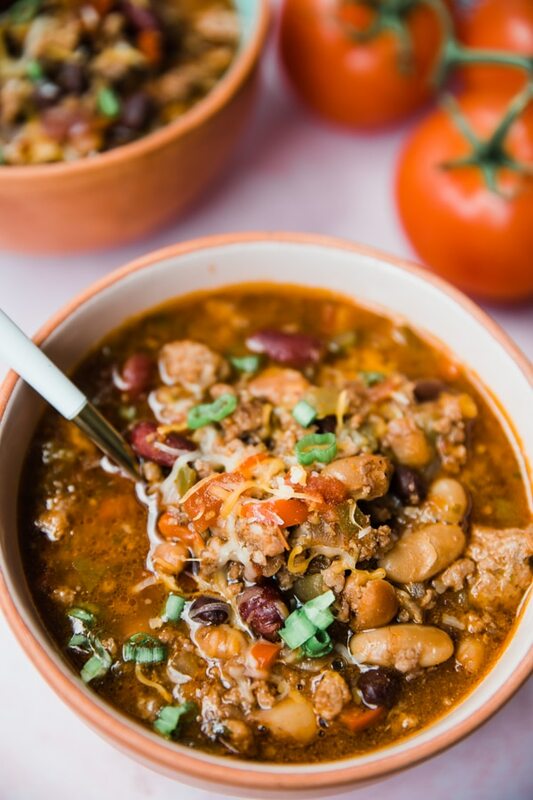 4 bean Spicy Crock Pot Chili - full of flavor and SPICE! 1 can El Pato tomato sauce - 4 oz. In a large frying pan, brown sausage and ground turkey with fresh garlic and olive oil over medium-high heat. Once cooked, pour into bottom of crockpot (crock pot does not need to be turned on yet). Turn the heat to medium and sauté onions and bell pepper for ~5 minutes. Stir for 1 minute and then transfer to crockpot. Pour all remaining ingredients onto the meat/onion mixture into the crockpot. Stir all ingredients together and set crockpot on low for 4-6 hours. Stir occasionally. Prep the seasonings the day before, or in advance, so it makes it easy to pour all seasonings in at once! 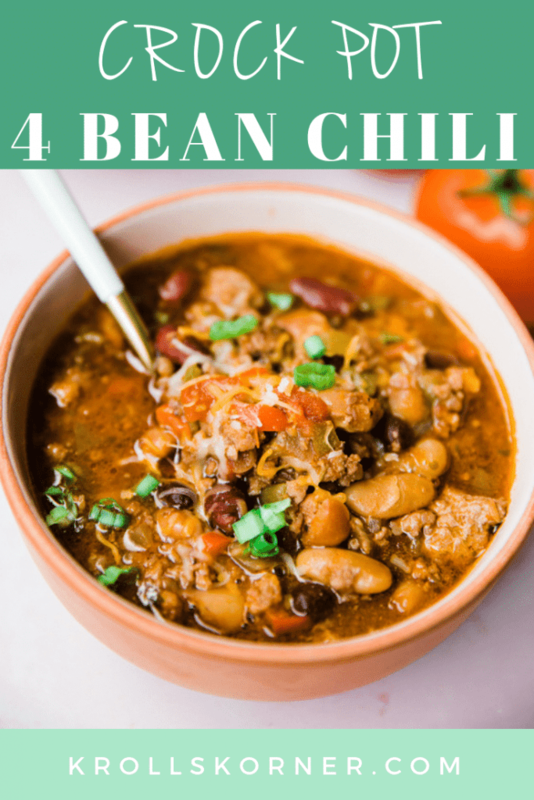 PIN THESE FOUR BEAN SPICY CROCK POT CHILI FOR LATER! 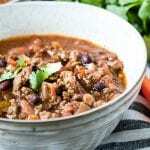 This chili looks so hearty and flavorful! Yum! Congrats on your new job!!! And whether it’s a sickness, birthday party, or Friday night in, I’m always in the mood for a good bowl of chili! PS. When did you have time to make this? You are one busy gal! This looks so yummy! Thanks! Mmmm – love a good chili! (and love the engraved spoon). This is probably the prettiest chili I’ve ever seen! Def want to try this out!